School Girls; or, the African Mean Girls Play is one of those plays that you could pick to pieces if you wanted to, but why would you want to? As the subtitle itself already suggests, much of the basic premise—and certainly key elements of characterization—are essentially very familiar, if not outright derivative. The easily recognizable scenario is more usually seen on the big screen, however, and typically involves rich, predominantly white, and exceptionally privileged U.S. American students. Jocelyn Bioh’s transposition of the cat-eat-cat world of teenage girls both to the stage and to Ghana is significant. 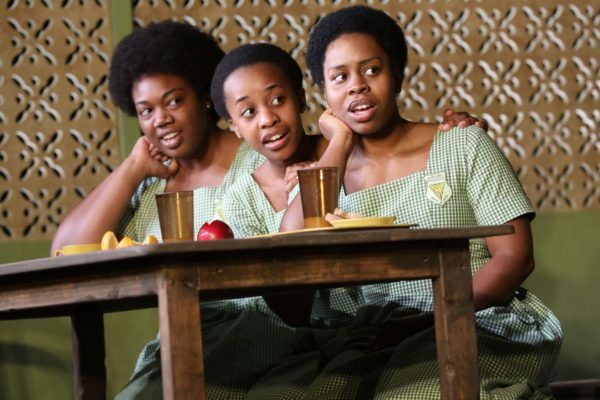 The play takes place in 1986 at the Aburi Girls’ Boarding School in central Ghana. Eighties pop music in the opening sequence quickly conveys the era, Arnulfo Maldonado’s simple set, aided by Jen Schriever’s lighting suggestive of hot sun outside, convincingly places us in a Ghanaian high school cafeteria, and the opening dialogue between the clique of girls leaves us in little doubt as to the broad strokes of their characters. Ama (Níke Kadri) is the smart, slightly nerdy one; Nana (Abena Mensah-Bonsu) is the unacceptably chubby, put-upon one; while Gifty and Mercy (Paige Gilbert and Mirirai Sithole, satisfyingly in sync) form a comedic duo of dim-witted, yet somehow endearing lackeys to the undeniable queen bee, Paulina (Maameyaa Boafo). Paulina’s reign is challenged, however, by the arrival of the effortlessly cool Ericka (Nabiyah Be), from the United States. The girls are overseen by the firm, but warm-hearted Headmistress Francis (Myra Lucretia Taylor), and the motivating crisis centers around the impending selection of Miss Ghana 1986 by former Aburi student and former Miss Ghana, Eloise Amponsah (Zainab Jah), 80s glamorous in silky pantsuit and large dark shades. So far, so familiar. The humor keeps the pace up and the jokes land easily, while Paulina’s unmitigated nastiness in the first half successfully elicits gasps. But that outright meanness fails to explore the more nuanced art of such types, who, in reality, usually exert a strong hold on their followers through an unpredictable alternation of true charm and cruelty. Indeed, the girls seem to see right through Paulina and barely hesitate in switching allegiance to Ericka. I felt a little uneasy too at what seemed to me a semi-unconscious U.S. condescension towards the charming naivety of the Ghanaian schoolgirls as the audience chuckled at Paulina’s boasting that her cousin in the States works at the “classy” restaurant, White Castle, and sends her the latest fashions from Conway and Chinatown. Yet the true worth and profundity of this play emerges gradually and quietly—beginning with the first hints of colorism as the girls admire Ericka’s pale complexion and long hair, referring to the blisters caused by bleaching creams. Without wanting to reveal too much, it becomes clear that the real competition is not the power struggle between Paulina and Ericka, or the Miss Universe pageant—or rather, it is those things, but they are part of a much larger struggle, in which the cards are most certainly stacked against poor, dark-skinned girls from Ghana. In this context, the fantasy of international recognition on the basis of beauty resonates deeply, even as other teenage girl obsessions provide effective comedic fodder (The Babysitters’ Club is “deep stuff”). If the first half of the play is in danger of being a little obvious, this is more than redeemed by the heartbreaking simplicity of watching the girls respond to a parade of European countries as the Miss Universe semi-finalists are announced. The characters gain depth too as we learn more about them, and the relationship between Paulina and Headmistress Francis in particular suggests a complex and moving history. It is not only the darker elements that compel me to dismiss my own criticisms. The production as a whole has a refreshing lack of pretension. There is something so undeniably likeable about the entire cast, who (rather ironically given the themes of the play) have clearly formed a strong ensemble. Free of theatrical mannerisms and committed to the spirit of the play, there is an energy and honesty to all of the performances. The younger women pour themselves into their roles, with Be and Boafo as particular stand-outs, while Jah and (most notably) Taylor offer measured performances that subtly allow their backstories and the connection to the present crisis to emerge. A light directorial touch by Rebecca Taichman is surely to be credited here also; a laudable approach especially in handling a first script by a new playwright. In framing her work within an openly derivative comedic genre, Bioh productively steers it away from a different cliché: tragic African tales. There is a sly element of resistance too in her positioning of teenage girls center stage. Apparently lacking even the moody tragic depth granted teenage boys, teenage girls might be the most easily derided and dismissed character—hence their general relegation to such lowbrow fare as Hollywood teen flicks; even rarer are works that give voice to the teenage girl of color. Her experience of the world might frequently manifest in seemingly risible superficialities, yet it speaks to the same patriarchal and racist forces that deny her more credible outlets for expression. As this nicely understated production and vibrant cast demonstrate, the cattiness, the social competition, the beauty-queen dreams of the teenage girl are only the surface—the ripple effect of more insidious, and more far-reaching, cultural violence. School Girls; or, the African Mean Girls Play runs to December 23, 2017. More production info can be found here.